Our three-piece children's dirndl set consists of a blouse (in the typical top shape), the dress and an apron. The white blouse has a gathering at the neckline and puff sleeves. The dress is black and can be easily tied under the breast by means of the band to 6 attached decorative eyelets. The yellow apron is pleated and wears the checked pattern of the dress at the hem again. The dress is closed at the side with a concealed zipper. Attention: Even children's dirndl always have special measurements! Please do not rely only on the specified size, but take a look at the measurement chart. The exact measurements (length skirt, exact chest circumference, etc.) for all three parts can be found on the left as a measure table in the pictures. The dirndl is available in sizes 3T, 4T, 5, 6, 7, 8, 9, 10, 11, 12, 13 and 14. Beautiful colors, excellent workmanship and a comfortable fit make this dirndl a must for Oktoberfest. Why spend a lot of money on a designer dirndl, if it is also cheaper? 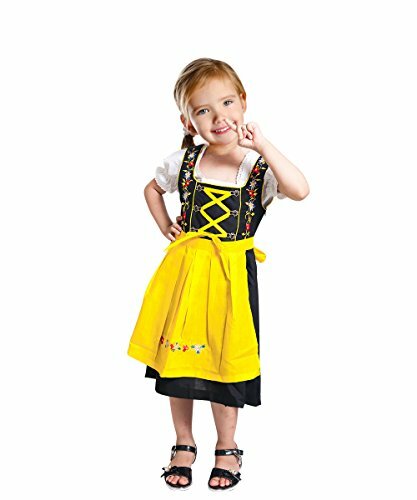 Give your daughter a real dirndl, turn her into a true bavarian and enjoy the looks your child will get in this costume. A traditional costume should not be missing in any girl's wardrobe, you will close this unusual dirndl dress in your heart. The next Oktoberfest, the next event will come and your child can proudly present the new Dirndl. Enjoy the attention, enjoy the Oktoberfest. We wish your daughter a lot of fun with her new favorite dress. Charming children dirndl-s in yellow, black and white. The dirndl is available in the following sizes: 3T, 4T, 5, 6, 7, 8, 9, 10, 11, 12, 13 and 14. Beautiful costume for girls. Ideal for the Oktoberfest. Fits the bavarian style leather pants. A country house outfit for young girls. Whether for the Oktoberfest or any other place, the Dirndel-s are the Oktoberfest outfit. An original bavarian costume. A cheap dirndl in beautiful colors is the eye-catcher at every festival. Of course also suitable for other occasions. With the matching Dirndl jewelry, the dress looks even more exciting than it already does. Such a great traditional dirndl dress is the special gift - for Christmas or birthday. Gift ideas for girls of all ages. Exceptional children's dirndl for the special Oktoberfest appearance. This dirndl costume is traditional. This traditional style is just right for very special occasions. Your child will steal the show at the Oktoberfest and become an absolute eye-catcher. The dirndl blouse and the dirndl dress are noble and held elegant and processed absolutely high-quality. For a special occasion, you should wear only the best. A beautiful Oktoberfest dress. A drindl to fall in love with. Beautiful colors, modern cut, this dirndl makes your daughter a real bavarian. An original bavarian outfit. Modern traditional style. Anniversary clothing for girls for the Oktoberfest. Why a designer dirndl for a lot of money, if you can buy good quality cheap? Whether as a traditional costume, as a birthday outfit, or as a rustic country house dress, this dirndl is perfect for any purpose. Your child will make an excellent figure in it, the clothes are suitable for every figure. Exclusive festive dresses or exclusive dirndl fashion are also a popular and especially suitable birthday gift. Be ready for Oktoberfest. If you have any questions about this product by Dirndl World, contact us by completing and submitting the form below. If you are looking for a specif part number, please include it with your message.